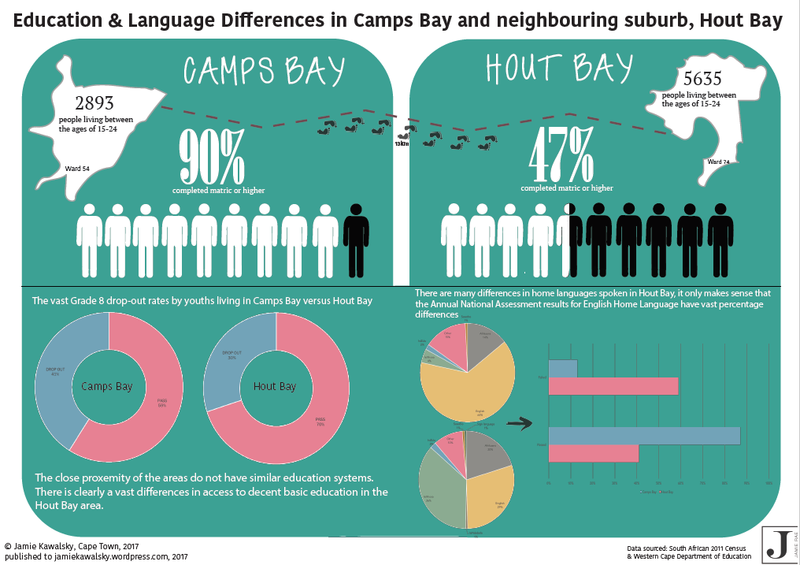 Designing infographics on educational inequalities in Cape Town's wards- a new #UCT Media Studies project. Written for Media Studies educators interested in teaching data journalism and infographic poster design. Professor Marion Walton, Dr Martha Evans and I recently prepared a five week course in which I taught second year journalism students to design infographic posters that focused on educational inequalities in two Cape Town wards. week 5: Short infographic poster presentations by students for assessment. All students had access to the Mendi lab, where they could learn to use Adobe Illustrator for detailed design work and Microsoft Excel for chart design. Most students had already been to a workshop that introduced them to youthexplorer.org.za. I taught its use for exporting Excel files, cleaning their data and preparing various comparative charts. Students also had the option of using Adobe InDesign in class or a similar alternative at home. A diverse group of students produced work in different infographic sub-genres in response to the lessons. The posters were shared to their blogs (see my Diigo social bookmark index for the public ones), as well as to other online accounts as part of the assessment process. Many students could not make every lesson due to anxiety over their safety. Violent protests at UCT by the #feemustfall movement and the near-militarisation of campus with private security and police resulted in students feeling anxious and unsafe. In response, they were granted increasing freedom to choose the software they had access to. While most students continued to use Adobe, several chose to use Microsoft Word, one Google Docs and another infogram.com). Students found exporting imagery to be challenging and will require better support materials on achieving quality exports. This is particularly important given the varied software that students may need to use. For assessment, students had to submit six files to Vula, UCT's intranet. An upload limit of 4MB on particular file formats, meant that several students required email advice on compressing their files close to the submission deadline. Again, support material should be provided upfront for students on compressing the graphics in their files, creating compressed web-friendly, low-res versions and also archiving their work to .zip formats. Interestingly, the students who compressed their work in .zip files could upload large files. Students submitted at least five files, which enabled the assessors to appreciate the process behind students' poster, rather than just the final project. While such insight proved valuable, it was highly time-consuming to assess, especially when combined with checking how students shared their work online. Consideration must be given to whether there is a more efficient way to assess the process. For students keen to work in data journalism, it’s highly important that they develop digital curation literacies. While this was spoken of in lessons and foregrounded through an assessment process that required students to evidence their process through uploading their source logo, chart- and poster files in addition to final work, it could be better emphasised. For example, the insights of Potter (2012) and his 'Curation and Media Education' manifesto could be drawn on for developing dedicated slides. These should highlight the benefits of having an archive of one's source documents and process, so that they can be refined, corrected or referred back in the case viewers raise concerns about their accuracy. Innovation was an important assessment criteria for students' work. The examples above should be used to suggest to students the wide variety of options they can choose from, rather than replicating my poster's look-and-feel, as a few defaulted to. Rather than assessing all work at the end, a draft presentation followed by a final submission would work better next year. This will give those students who went for the wrong goalposts feedback they can use to adjust their direction. To improve their analysis, students would benefit from being exposed to South African research into educational inequalities and relevant concepts from educational sociology. Students would also benefit from seeing examples of what not to do. For example, do not confuse correlation (i.e. high internet access..) with causation (... supports a high matric pass rate! 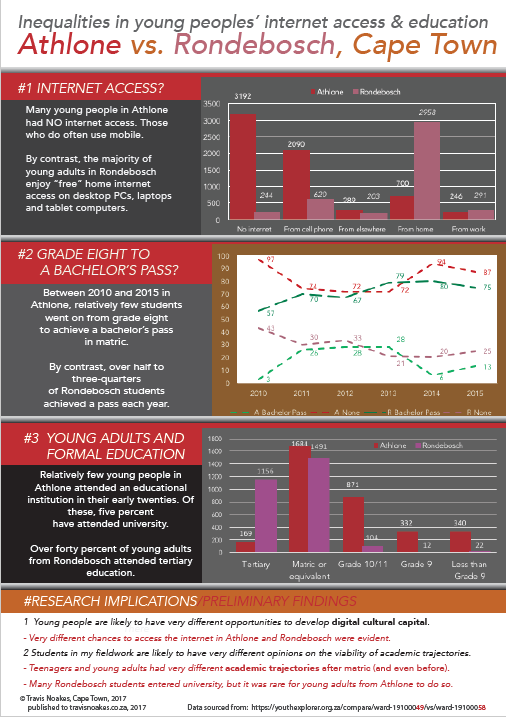 Rather internet access is a marker of privilege that is often linked to households that can afford better schooling). N.B. You are most welcome to suggest further recommendations in the comments box below, ta!